Upper s chool teachers Annie Gruenwald and Zora Tucker took the eleventh grade class on a Global Studies field trip to visit and explore the Baitush Sharaf Jame Masjid and Islamic Center mosque in Crown Heights, Brooklyn and the Hindu Society of North America temple in Flushing, Queens. The students have been studying the 1947 Partition of India, which led to the creation of Pakistan. This trip allowed them to further explore some of the cultural and historical influences which led to this significant political event. 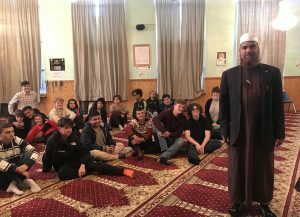 The Imam of the mosque spoke with the students about Islam, and took their questions. At the temple, the students had the opportunity to discuss Hinduism with a member. They also had the pleasure of visiting the on-site canteen, where they were able to sample some of the South Indian fare, such as dosa, a savory rice and lentil crepe served with a variety of vegetarian fillings, offered there. This unique opportunity provided space for the teachers to discuss with their students some of our key values, such as peace, tolerance, and diversity, here at MMFS.